If you have a home improvement job that you are not able to do yourself, or need a fix of your car, what would you do? I would have to go through my local listings such as Yellow Page to find a qualified contractor, like I recently did when replacing our oil furnace. I guess most people find the contractor or mechanic they need from traditional listing services or through references from family members or friends. That’s what we usually do. Now how do you like the idea of an online marketplace that lets you select qualified contractors, who are also reviewed and rated by others, and name your own price on how much you want to pay for the job? Just like you would do at Priceline.com when making flight/hotel reservations? Sounds interesting? Actually, there’s already such a place to let you do just that, at ServiceLive.com. Founded in 2007 as a wholly owned subsidiary of Sears Holdings Corporation, ServiceLive has spent the last year recruiting and conducting background checks on the best service providers in the country across a wide variety of home services – from handymen and home electronics pros to plumbers and computer experts. So the website actually has been around for a while and knowing that it’s a subsidiary of Sears makes me feel a little more confident about its legitimacy. 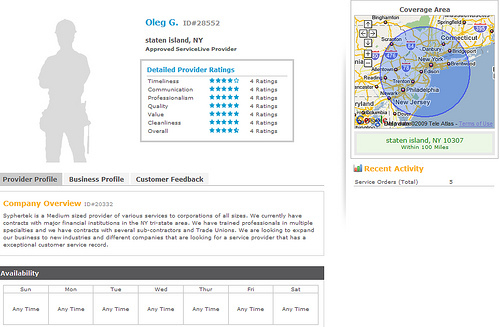 I never used this service before, so I have no idea on how good or bad it is. But I did do a little check on what are offered. 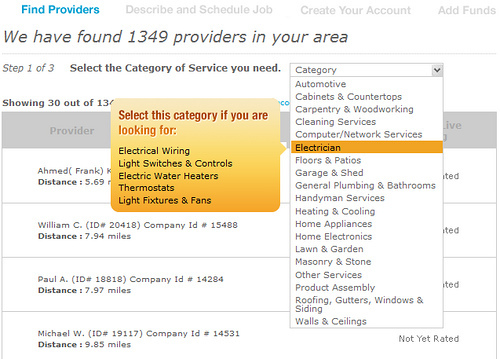 After entering my Zip code, ServiceLive found 1349 providers in my area, from Automotive, Electrician, to Heating & Cooling and Lawn & Carden, covering almost every area in which you may need some professional help. I then clicked one of the automotive contractors’ link to find a little more information about the service, customer feedback and ratings, and the area that the contractor covers. For a service provider to be listed on ServiceLive, the provider has to pass a background check, including criminal, vehicle, and civil records, required by ServiceLive’s Fortune 500 customers. According to the AP article which led me to the website, ServiceLive so far has already recruited more than 9,000 providers across the nation and 23,000 more are in the process of being approved. That’s a quite large number. In addition to Name Your Own Price, you will need need to pay a small fee, $10 to be exact, to get your job listed on ServiceLive, and once your job is completed by a service provider from ServiceLive, it will collect 10% of the total cost as commission. To get started with ServiceLive, you will need to follow these steps to set up your account and provide descriptions of the job you want to get done. Remember, the fees must be paid up front, even though they are held by ServiceLive until the work is completed. Describe your project, set your schedule and name your price: You can even upload photos and instructions to help providers understand your project. Create and Fund your account: Enter your contact information and upload the amount you named for your project into your ServiceLive Wallet to let providers know your project is real. You maintain control of your funds until the project is completed to your satisfaction. Post your order: Your selected providers compete for your business – the first one to accept your terms wins! A provider also may respond with a counter offer for a different time or price. Remember, the more providers you select, the greater chance that you will receive your price and time. Pay provider from your ServiceLive account and rate provider: Once the provider has completed the project to your satisfaction, just click “Close and Pay” to move funds from your ServiceLive Wallet to the provider’s Wallet. Then rate the provider, and you are ready for your next ServiceLive project! So, what do you think of this service? Are you going to use it for your next repair job? And do you think it can save you money?